the question is what should be the patch. as the kernel _has_ officially PCI support, it's logged on boot - so much theory around as I myself have no components to test and see with own eyes. btw: still could be there is just no this driver for wifi card compiled in - I already asked - can you tell me again what conf option is module for this BCM94322HM8L ? last time I enabled B43 as had the feeling from google it should be it ,but maybe even not . by any chance can you provide sample of such MKV? what fps it is and what IMX6 device you have ? I never seen a movie to tear personally (although much experience with GUI tearing ). I would worst case send it to the XBMC decoder programers to look at it. (19th Jan, 2015 06:57 PM)mk01 Wrote: by any chance can you provide sample of such MKV? modprobe: FATAL: Module ssb is builtin. workaround available = workaround has been posted here or in previous thread. update issues, status: Not Solved/Workaround available in Beta 2 thread ? XBMC rebooting after updating. Status: ? CDROM not working. Status: Not solved/workaround available in this thread. - XBMC rebooting issue: was never really an issue from the xbian side but was caused by an incorrect combination of packages forced by the user. - CEC: don't own CEC tv so ? - CD-Rom: also not sure. - KODI: Is simply not stable in our honest oppinion, but is available via apt. Just tried XBian on a Cubox-i 4pro again (switched to Openelec a while ago). 1. CEC works, though sometimes it does not seem to pick up the signal from the remote, I do see the TV led blinking. Have to do more testing. 1. I had to calibrate the screen (it was "zoomed in") but after a reboot, the system forgets the calibration and I have to do it after every reboot. 2. Contrary to what I stated here earlier, USB drives are properly automounted as usb0, usb1 etc. NTFS works fine and fast (I disabled sync option via Xbian config). Only ExFat is not supported. Do you get that with confluence? Sorry for my slow response, it was with Eminence. This one runs at my parents place and I haven't visited since so I cant test now. 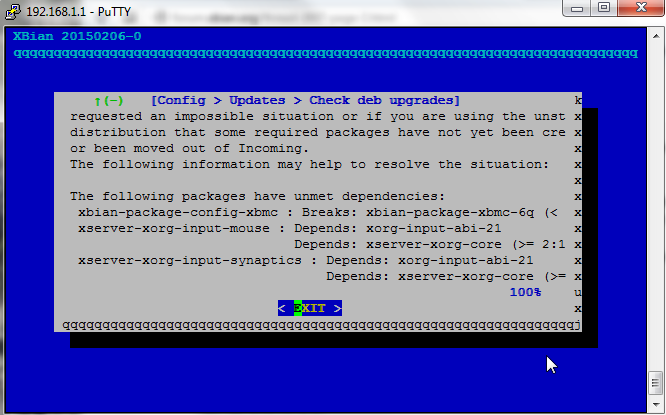 Also one I forgot to mention: Updating XBian is still not possible I have never been able to update XBian on a Cubox-i. This is the reason why I switched to OpenElec, not that I want to update, but since there were bugs I had no choice and unfortunately it never worked and after trying few things I gave up, after which a working workaround was presented. Now, with the 7Feb image, updating fails. Everyone can reproduce it by installing that image and try to update after first boot is completed. This is making me sad! @IriDium or @CurlyMo can you help this ^^^ issue? Richard and I dont have a CuBox. I also have an issue with my esata drive. I have created a seperate topic here to ask how we can add "automount" feature for eSATA connected drives. But even when I add my drive (using the UUID) to fstab, it does not work at boot. After reboot I have to manually run "mount -a" which correctly mounts the drive to the folder I created (/media/esata). I did not create a ticket since this is still a bit vague to me why mount -a does work. Ok I've managed to upgrade to a point!! I started with 20150206-0 and using ssh xbian-config upgraded individually leaving firmware-imx. 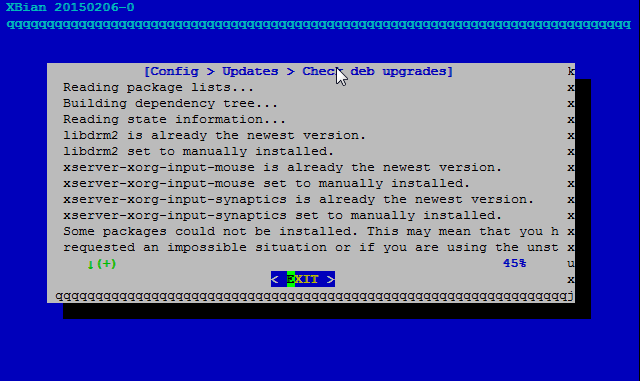 Eventually all packages were installed except firmware-imx and libdrm2. I then rebooted and then ran apt-get upgrade. This installed iibrm2. When trying to upgrade firmware-imx i get the following error. Xbian is now 20150218 on stable. (19th Feb, 2015 08:51 PM)IriDium Wrote: Ok I've managed to upgrade to a point!! so now you have kodi? E: This installation run will require temporarily removing the essential package firmware-imx:armhf due to a Conflicts/Pre-Depends loop. This is often bad, but if you really want to do it, activate the APT::Force-LoopBreak option.